Whether you’re outfitting your new kitchen or just fancy an interior countertop change, it is imperative that you choose a suitable material for your kitchen countertop. This is because choosing the right one will save you much trouble and hassle in the future. And with the right materials, you can ensure that your counter will match the decor and style of your kitchen. Granite is still a popular choice with homeowners for its unique patterns and durability in the kitchen. While it may require a bit more care to keep its polished good looks, it is relatively easy as you just need to make sure that you wipe up spills quickly and maintain a regular sealing routine every year to keep its shine as good as new. Also known as engineered stone, quartz material is the best choice for homeowners who like a maintenance free countertop. Unlike granite, it doesn’t require annual sealing to keep it looking shiny and it’s available in a huge range of colours. However, using this material in your kitchen can cost some damage to your wallet but it is a worthwhile investment. Generally, rustic kitchens like to make use of wood for their kitchens, including the food prep surfaces. You just need to ensure that it is properly sealed and even cutting meat on top of it is sanitary. This pocket-friendly option looks warm and inviting while having the added benefit of being highly heat resistant. This material is perfect for those looking to transform their kitchen into a luxurious, high-end space. This elegant material can cause your wallet to take quite a hit, but it is worth it for that gorgeous kitchen you’ve always dreamed of. Just remember to upkeep its sealing routine and mop up messes quickly to keep it looking awesome. You may be thinking that stainless steel can make the kitchen look rather cold and harsh, but it goes perfectly well with an industrial style kitchen. Stainless steel is one of the hygienic materials and is suitable for food prep. Stains can also be easily cleaned by wiping it off. Glass creates an overall look of sleekness and modernity, thanks to its streamlined appeal which can make your kitchen look really contemporary. Similar to stainless steel, this material is non-porous and comes in many colours and sizes so you have a wide range to choose from. Highly durable and able to withstand heat well, concrete is also a wise choice for your kitchen countertops. But to keep them stain-free, regular sealing must be done to keep them in pristine condition. 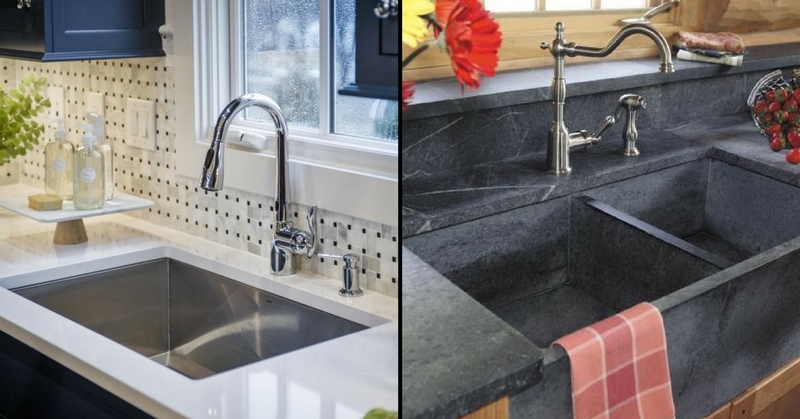 While soapstone is known to be rather soft and pliable, it is surprisingly resistant to stains and heat, two factors which are very important in the kitchen. And this material doesn’t require regular sealing unlike some others, but you will find that applying mineral oil on its surface helps to reduce scratches and add sheen. If you are feeling handy and want to save on labour cost, then having a tiled countertop is the way to go. It is also inexpensive and comes in a vast variety of styles to choose from. But be warned though, you should probably choose a dark coloured to disguise any stains. This is a slightly unusual material to use for a kitchen counter, as this metal is considered to be a “living material”, which means the colour and sheen will change over time. On the other hand, copper is said to be naturally antimicrobial and is the best material to use if you want a truly lived in kitchen that bears witness to all your culinary experiments.